The integrated Ocean Drilling Program (IODP) and the Deep Carbon Observatory (DCO) co-sponsored "Reaching the Mantle Frontier : Moho and Beyond - A Three-Day Workshop" from 9-11 September 2010. The workshop was held at the Broad Branch Campus of the Carnegie Institution of Washington. 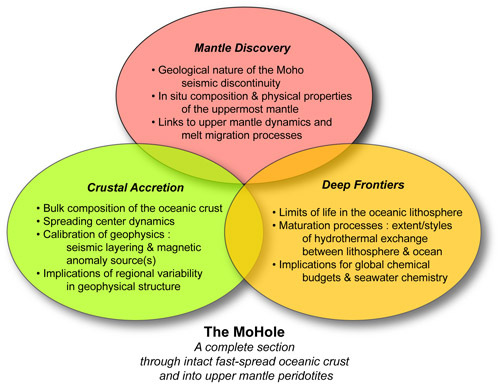 Both the IODP and the DCO recognize that a longstanding goal of the scientific ocean drilling community (to reach the mantle and in the process penetrate the entire ocean crust and the Mohorovicic discontinuity) will benefit from an opportunity for a broad scientific community to consider the opportunities and challenges of this goal in the context of both scientific and technical perspectives. The workshop attendees included key scientists and engineers from academia and industries that aspire reaching the mantle in a timeframe of 15-20 years. The purpose of this workshop was to identify key scientific objectives associated with innovative technology specifications along with associated timelines and costs for developments and implementation.